We’re kicking off this year’s Outdoor Extravaganza with a Plants and Flowers link party. Come share your projects! Yesterday, I shared my strawberry pot herb garden with you, which is a little different take on the way I usually grow these summer essential plants. The other hosts of this outdoor series, Tiffany, Carmel, Dawn, and Barbara, have also been busy playing in the dirt. Check out all their inspiring projects! I’ll be sharing my top Plants & Flowers project picks over the next week on Facebook and Twitter, so watch for yours! Also, be sure to come back next Wednesday for the Outdoor Decorating Link Party! Thank you so much for hosting – I’m looking forward to checking out the links! I think it was just before that. I remember reading your sweet pea post. Yes, time flies! Thanks for stopping by and linking up again! 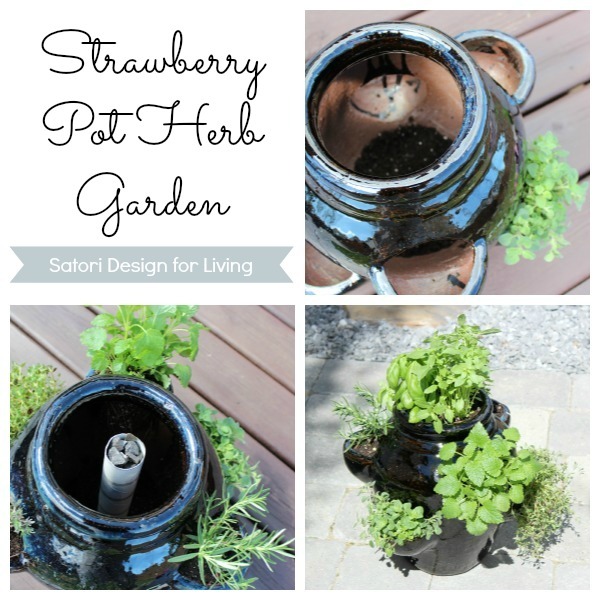 Your strawberry pot herb garden is a great idea. My mom made a strawberry pot years ago in a ceramics class. I’m going to see if I can find it so I can plant some herbs in it :-) Thanks for the inspiration! I’m really behind this year with the late snow and cooler spring weather. It seems like summer has finally hit, and now it’s catch up time. Enjoy your May long weekend!